The secret to Golden State Chem-Dry of Upland/Rancho’s clean, is the millions of microscopic, carbonating cleaning bubbles in our cleaner we call The Natural®. This carbonating solution penetrates very deep into the base of your carpet, exploding grime and dirt off of the carpet surface. We then use a hot water extraction to lift the dirty particles to the surface where they are easily vacuumed away. This carbonation process is almost identical to using club soda to remove a stain from a shirt. The awesome cleaning power of the carbonating solution creates a powerful reaction that deep cleans your carpets and upholstery in a safe and gentle way. 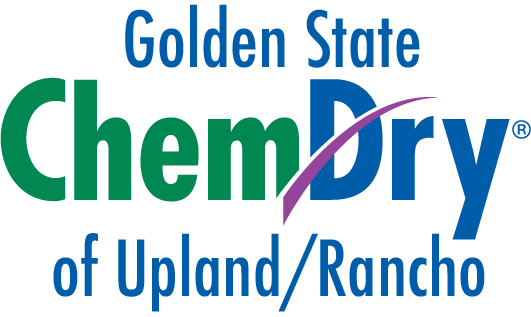 Due to the natural power of carbonation, Golden State Chem-Dry of Upland/Rancho does not have to use excessive amounts of moisture to clean your carpet or upholstered items. Because the bubbles do the work for us, Golden State Chem-Dry of Upland/Rancho does not need to use soapy and sticky cleaning chemicals that other cleaners and do-it-yourself machines rely on so much. Soapy residues have a tendency to attract dirt like a magnet, causing your carpet to get dirty even faster than before. Through the use of Golden State Chem-Dry of Upland/Rancho‘s carbonated carpet cleaning solution, Golden State Chem-Dry of Upland/Rancho can thoroughly remove stains more quickly and efficiently. We apply our solutions so sparingly, and without high pressure, resurfacing of stains is not a problem. However, if a spot does reappear, then so will Golden State Chem-Dry of Upland/Rancho until the problem is solved.